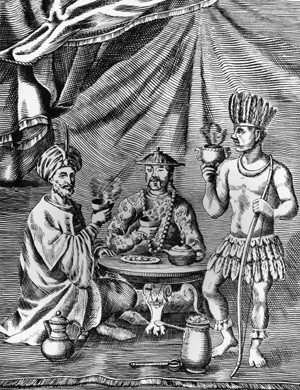 From “Traitez Nouveaux & Curieux du Café, du Thé et du Chocolate (New and Curious Treatise on Coffee, Tea, and Chocolate),” by Philippe Sylvestre Dufour, 1671. Visitors to China might be forgiven for concluding that history carries more weight here. For whatever the reason, even the far-off ghosts of the Opium War, the scramble for concessions, and the Treaty of Versailles still haunt contemporary politics, causing many observers to see echoes of the past in the present. Today on Sinica, Kaiser Kuo hosts a special Christmas episode of Sinica with two of Beijing’s resident academic experts: David Moser, Academic Director of CET Beijing and popular essayist on all things China, and Jeremiah Jenne, Dean of Chinese Studies at the IES program in Beijing. You may also know Jeremiah as the force behind the popular history blog Jottings from the Granite Studio.